Handmade in Honduras, wrapped in a golden Ecuadorian Connecticut Shade Wrapper Gispert Cigars great mild-medium bodied cigars. 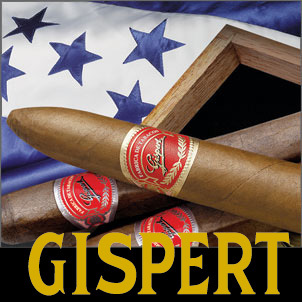 With its Honduran binder and Honduran and Nicaraguan fillers, Gispert's are smooth and creamy, with a cedry finish. Additionally, with a distinct hazelnut flavor, this is a very creamy smoke with a tangy, sweet, cedar finish. These moderately-priced cigars have a long history that traces back to Cuba in the 1800's. The construction and the quality of the leaf used in this cigar are excellent, and it received a '90' Rating from Cigar Aficionado. So try any of the six (6) affordably priced sizes of Gispert Cigars and then come back for more when you are happy.